In south Texas it doesn't necessarily get cold until about mid-December, until then we are experiencing low 80 to 70 degree temperatures, which makes dressing for fall so hard, because layers are currently not an option! Boots on the other hand are the closet we can get to "dressing" for fall without having to feel a little warm, and breaking a sweat. I'm so excited to have found a pair of "over the knee boots" at my work this past month which are very similar to the ones pictured above, so I'm so eager for the weather to get a little cooler so I can sport them with leggings or denims! Below I will explain the boots pictured above which I have one of each and how I'm hoping to wear them this fall/winter. 1.) Combat Boots (dark brown boots w/ laces): Combat boots are so fun and unique out of all the boots I feel. They give you that perfect touch of "edgy-ness" but still look like a boot so it's not too rough. I like wearing combat boots with denim jeans, or even toughen up a delicate dress by wearing this style of boot along with a denim jacket. 2.) Fringe Booties (fringes hanging from side of tan boot): Fringe is definitely in this season, you can find fringe on boots, sandals, handbags, and even tops or dresses! So to transfer your summer boho style to fall/winter, a fringe bootie is a must. I like wearing this style with skirts, dresses, leggings, or even maxi skirts. 3. Two-tone Riding Boots (black top w/ brown boot): The rider boot is a classic fall/winter staple. These boots have been around for ages, and are comfortable since they are flat and normally go to about the calf-area, so not too high or too low. I love wearing my two-tone rider boots with skinny denim jeans, or tights and a dress, such a comfortable look and looks like you are dressed to impress. 4.) The flat bootie (grey boot w/ no heel): I always feel like this style of boot is very "indie". I'd wear this style with skinny denims and a loose cream colored top, with a long necklace and a floppy hat. This boot is comfortable for a day time look around the city, since it has no heel it's easier to walk in. 5.) Quilted Boots (black quilted style boot): Anything quilted always gives me "Chanel" vibes, so I see "class" in this style of boot. It has a fancy feel and probably shouldn't be an "everyday" boot. I'd wear this style with denims but a more dressed up look, like a nice blouse, or a chic dress with tights. 6.) Over the knee boots (tall heeled boot): These boots scream fun and out there! Definitely a boot that should be worn when fun is in the works, and this style will definitely turn heads. I like wearing this boot with dresses, shorts, skirts, and skinny jeans or leggings. 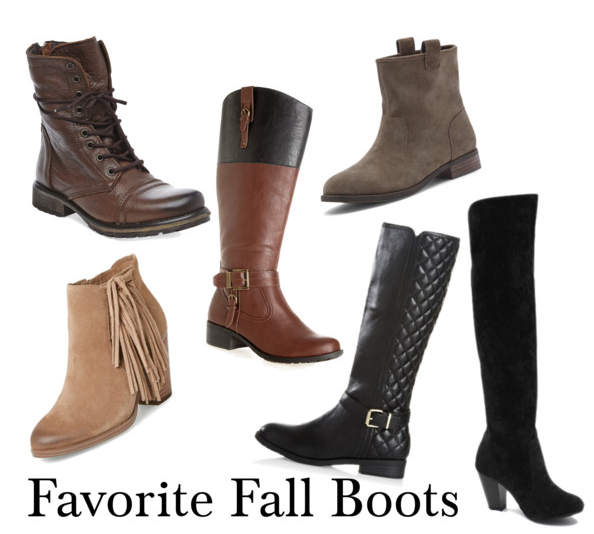 Hope you find your favorite pair of boots this season and rock them! Be adventurous and daring, have fun with your style, who cares what anyone else thinks! People will admire you for being yourself.